Looking for a perfect location to get married at Doylestown PA? Aldie Mansion is one of a kind and such a unique, exquisite wedding venue that features impeccable Tudor architecture. Its beauty and charm fascinates both newly engaged couples and wedding photographers. Without a doubt, it is among our favorite venues as well. And let me explain you why this is so. From marvelous brickwork, antique tiles to charming garden ornaments, Aldie Mansion has so much to offer for some splendorous, dreamy wedding photographs. For example, if you are looking for a perfect spot to photograph a big bridal party, you can go with the gorgeous frontage of the Mansion or position the group in front of the back side of the building, right where the grand steps are. Another great option is the where the ceremonies are being held. There are also plenty of hidden spots with colorful and splendid backdrops for the portraits of the bride and groom together. I especially love the arch inside the white wall which is to the right of the back entrance of the Aldie Mansion. When the door is opened, it lets some natural light in and the white wall serves as a perfect reflector. 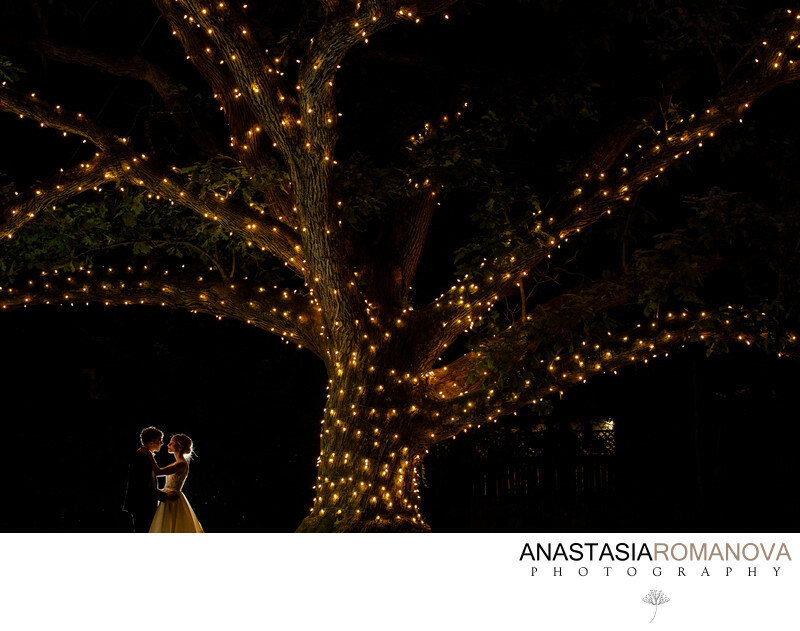 The might time photo of the bride and groom in front of the huge lit tree at Aldie Mansion is without a doubt a must-have shot. It might also be changeling sometimes to find some unique ways to photograph the same scene over and over again. To achieve this particular look on the photograph above, we placed the bride and groom to the left of the tree and slightly in front of it. We exposed to the lights on the tree in order to get the desired background look and lit the couple with a bare flash from the back.